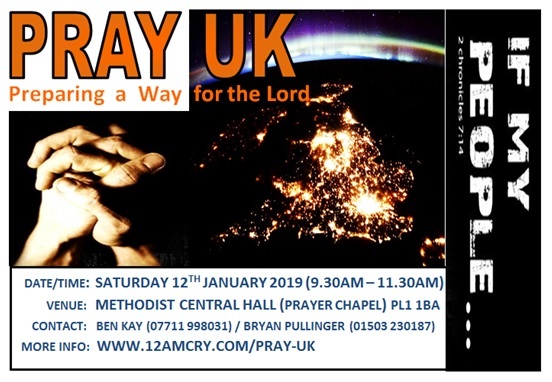 The next PRAY UK meeting takes place on Saturday 12th January 2019 from 9.30 – 11.30am at Methodist Central Hall in Plymouth City Centre (PL1 1BA). Please note the change of venue as the PRAY UK meeting will follow on from Singing Rooms (7 – 9am). This creates an opportunity for us to start next year with a morning of praise&worship followed by prayer&intercession…feel free to come for all or just part of the morning.